S’mores are a fun part of summer but if it’s too hot outside for a fire, move your S’mores Party indoors with these yummy Salted Caramel Indoor S’mores! Holy heat, batman! 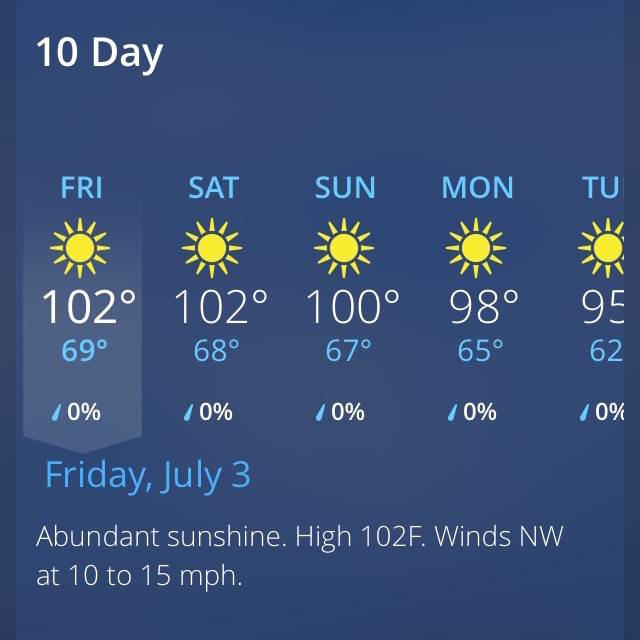 This weekend is going to be a little warm ’round these parts. Not so good when you want to spend the holiday weekend outdoors. Sometimes living in the desert means missing out on some of the fun parts of summer– the outdoor parts– because it’s just too darn hot to be outside. Air conditioning sounds a lot more appealing that sweating your face off! One of the best parts of summer? S’mores!! But it’s not very fun to be out in 100 degree weather, over a roaring fire, roasting marshmallows. Don’t worry– I got your back. You can totally make awesome s’mores in the comfort of your own air conditioning, provided you’re lucky enough to have a gas stove in your kitchen. Gas stove flames -= fire!!! Even better– you can fancy up your s’mores and make them extra special. I added some salted caramel to these ones. It’s such a great way to mix a nostalgic childhood treat with a fun, more grown-up dessert. And the best part is these s’mores can be made in less than 10 minutes. Easy peasy. 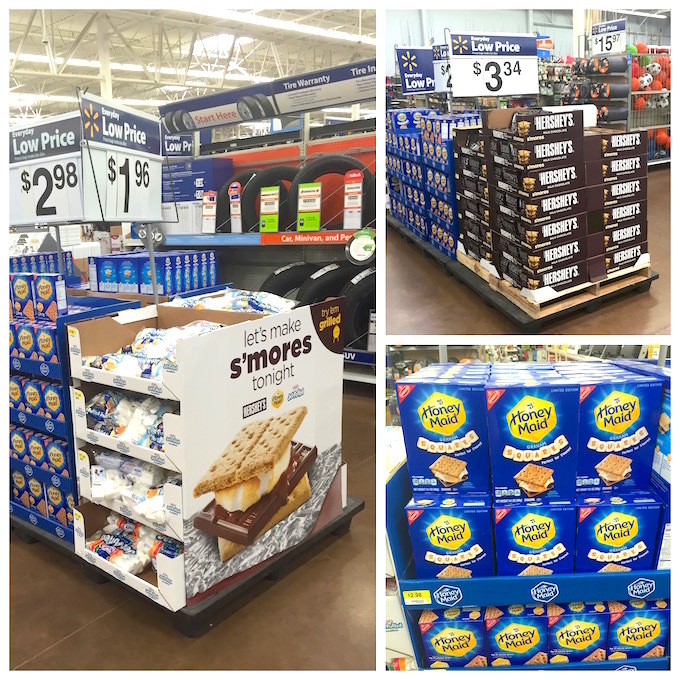 I saw this huge s’mores display in the outdoor section of Walmart the other day and got really excited about summer. Then I remembered how hot it is, but I decided to get everything anyways and figure out a way to beat the heat! I picked up a package of Honey Maid Graham Crackers, a 6-pack of Hershey’s milk chocolate bars and some Kraft Jet Puffed Marshmallows. 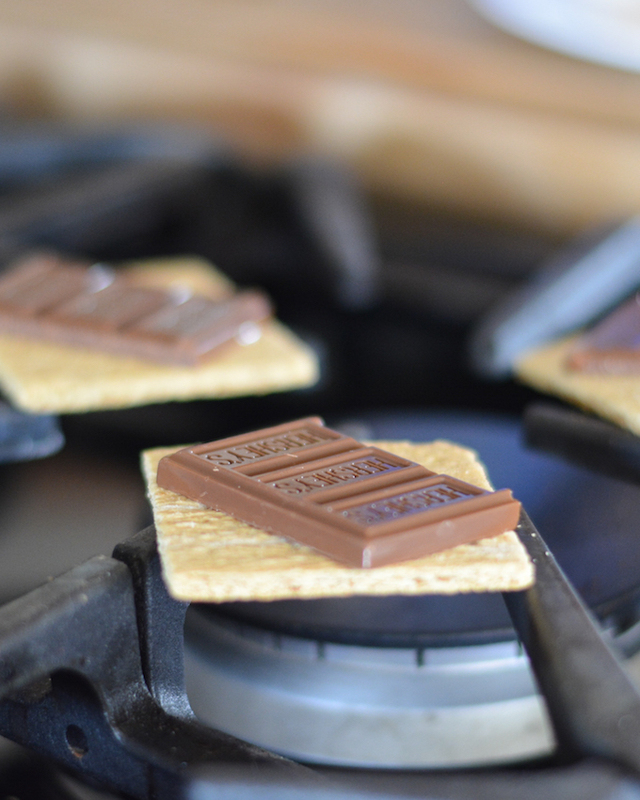 Cooking your s’mores in the kitchen is the perfect solution. 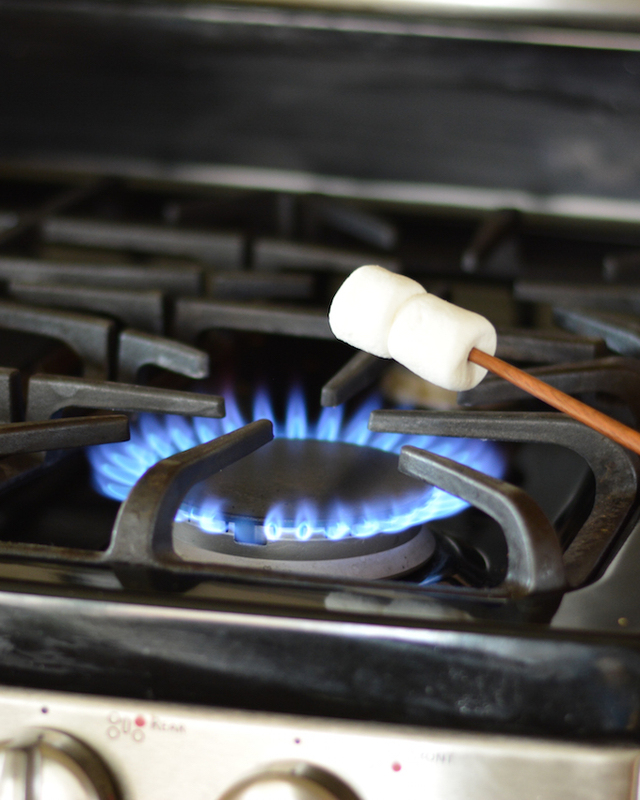 With your gas stove, any day can be a s’mores day. So if it’s too hot for a summer bonfire where you live, invite your friends over for an indoor s’mores party! To make the s’mores, I preheated one burner and then turned it off and set my graham crackers and chocolate on top while I prepared everything else. The warm burner provided just enough heat to perfectly melt the chocolate. Next, I microwaved some Kraft Caramel Bits (found near the chocolate chips) to melt them. If the caramel is too thick, you can add a splash of milk. Now it’s time to roast your marshmallows! Skewer your marshmallows onto a stick (I used a chopstick) and turn your burner on high. Very carefully, brown your marshmallows. Make sure to supervise if you have kids making these, the marshmallows can definitely catch on fire if you get them too close to the flame. Personally I love a scorched marshmallow! Once your mallow is toasty, it’s time to put everything together. Sandwich together the graham crackers, chocolate and marshmallow with a drizzle of caramel and a sprinkle of coarse salt. And enjoy!! 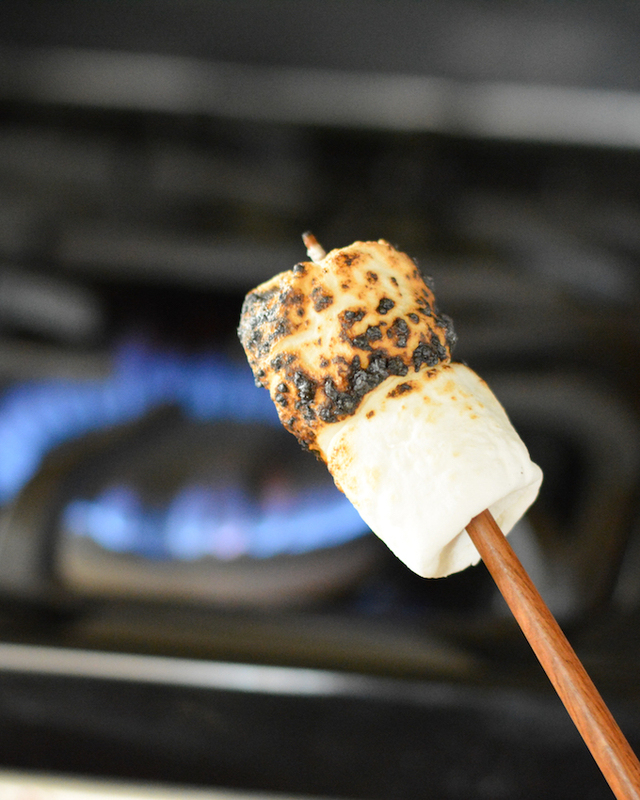 It was so much fun making toasted marshmallows in the kitchen. For a fun party idea, you could set up a s’mores bar with different flavored graham crackers, marshmallows and a variety of chocolates. Let your guests mix and match. And of course, stay cool! Turn on two burners of a gas stove and let them preheat. Break each Hershey’s bar into 4 pieces and place 1 piece onto each graham cracker square. Turn one burner off, and set the graham crackers (with chocolate on top) carefully on top the burners. The warmth should melt the chocolate perfectly. Place caramel bits in a microwave safe bowl and heat for 30 seconds. Stir, then heat an additional 30 seconds. If the caramel is not thin enough, you can add a splash of milk and stir. Repeat until smooth and melted. Poke the marshmallows onto skewers, sticks or chopsticks. Toast them over the burner’s flame. 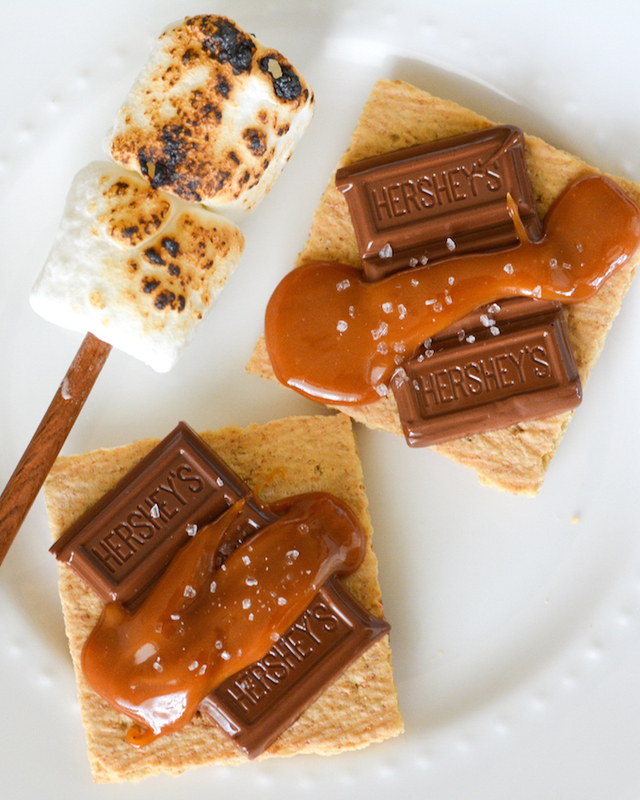 To assemble the s’mores: Top each graham cracker/chocolate with a drizzle of caramel and a sprinkle of coarse salt. Then top with toasted marshmallow and an additional graham cracker. Making s’mores is a fun way to celebrate summer. How are you making yours?! Oh man, these smores look amazing, Jess! 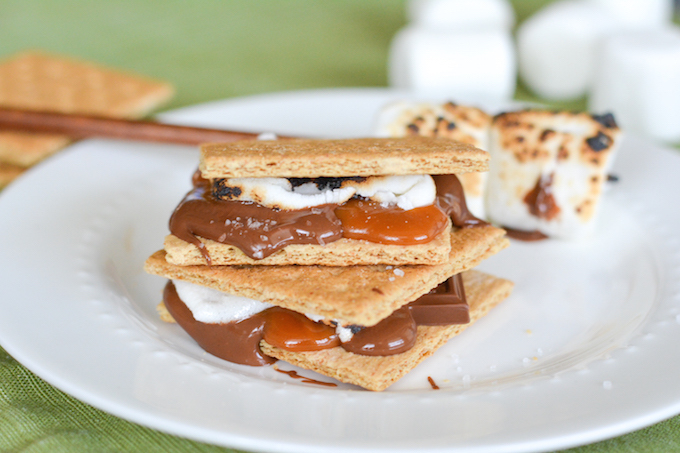 Caramel is such a genious idea to add to smores! I love this and making them inside is such a great idea, too! Thanks, Gayle! They were so yummy! Did you just melt away this weekend? Thank goodness our 4th of July BBQ had a pool. Otherwise I would have DIED! Instead, I got to spend like 4 hours standing and chatting in the pool. Haha! This smores are amazing! So smart adding caramel. Yum yum! They’re seriously AMAZINGGGG!! You need to try some! Thanks, Stephanie! We’ve already made them again– so easy and yummy! These are brilliant! It’s also super super hot here, so the idea of making s’mores by a campfire isn’t very appealing. However, the idea of doing them inside AND with salted caramel? Love it! This looks incredible, Jess! We love s’mores and it’s been so hot around here too so an indoor one sounds perfect. Love the salted caramel! Gah! Love these indoor s’mores – and what a great way to make them. Especially in that heat! You’re so innovative and it results in a fun indoor treat. Pinned! You are making me so hungry for a s’more right now! 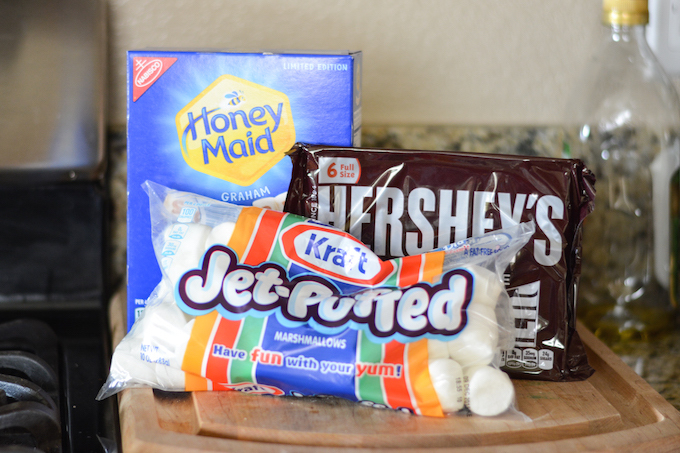 I love that with this recipe I can make s’mores anytime without a campfire. 🙂 The salted caramel is such a great addition! 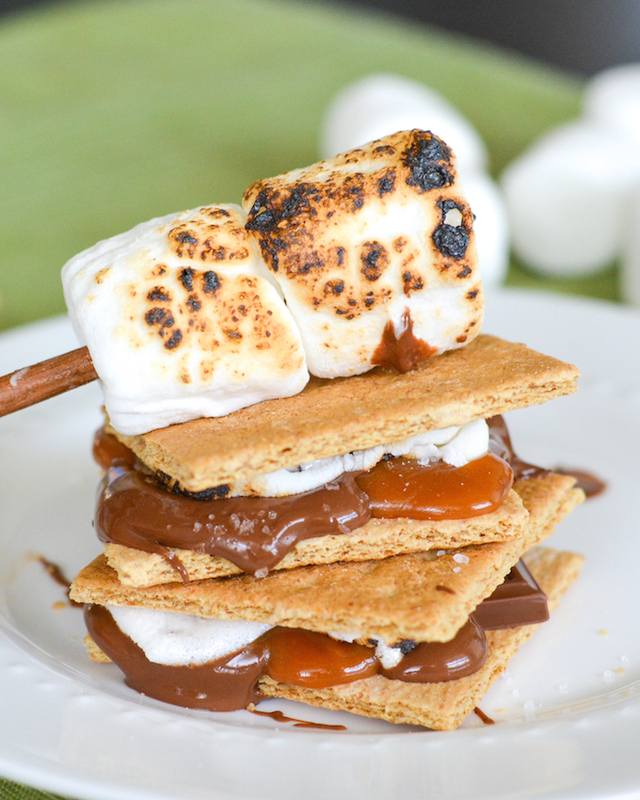 I am a total caramel-kinda girl and these smores are absolutely calling my name! I love that they don’t require a campfire to make! Thanks, Sarah! It was fun making them inside. I might be breaking this idea out in the winter, too! Drool! That salted caramel is making my mouth water! 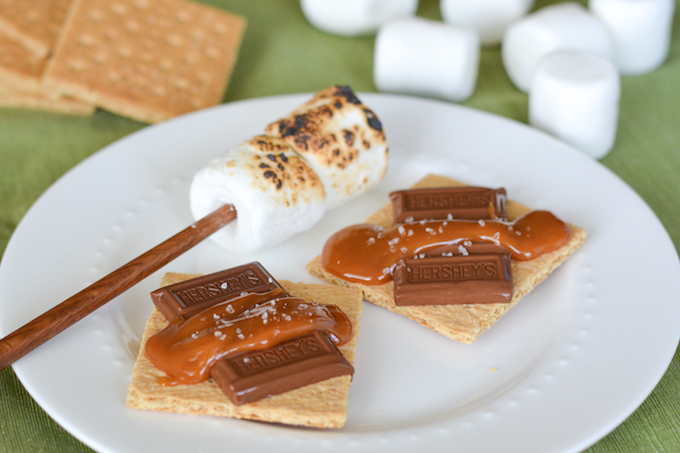 The perfect addition to a s’more! The salted caramel addition to this is just perfect, I love this idea! Oh, and that weather forecast made me cringe… so hot!! 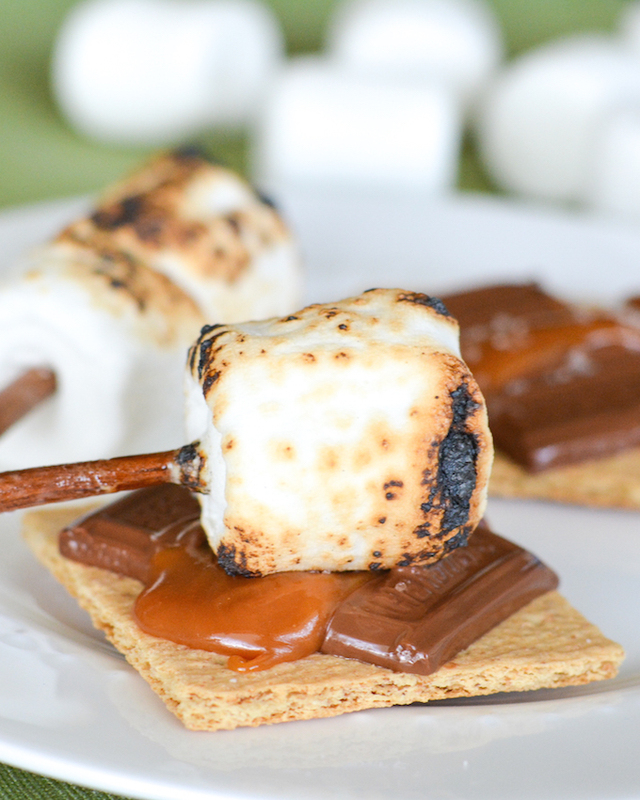 These s’mores look phenomenal! Adding the salted caramel sounds too good. OH my gosh…drooling so hard over here. I am in looooove with the idea of adding salted caramel to s’mores. I have to try this!! And I love the convenience of making them inside when its wayyyy to hot out :).